Thirty years on and Def Leppard is still one of the most important bands in rock music. Over 100 million albums sold, a catalog of rock anthems and a reputation for spectacular live shows attest to that. 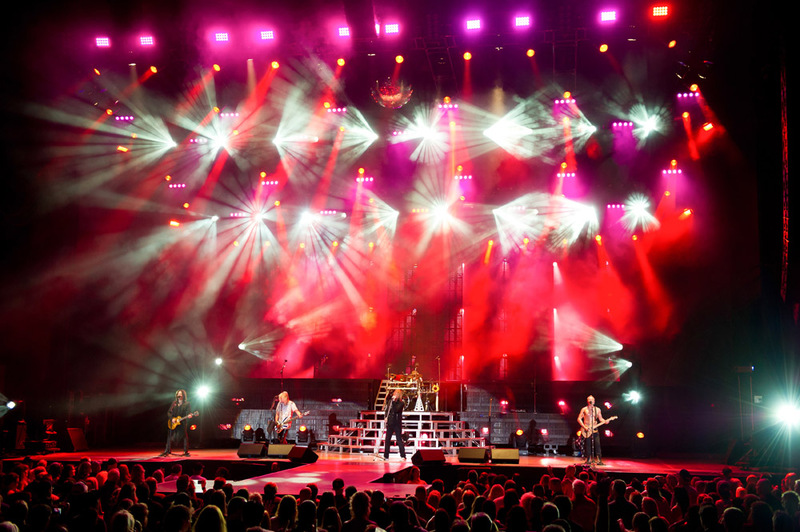 The band has always had a loyal following in the U.S. and has just wrapped up a “Rock of Ages” summer tour there with lighting design by Kenji Ohashi. Kenji's design was phenomenal using the Union Jack as its main theme and lit by a mostly Martin Professional lighting system supplied by Upstaging. For the summer 2012 tour Upstaging supplied 46 MAC Auras™, 28 MAC III Profiles™, 36 MAC 2000 Wash XBs™, 8 MAC 2000 Beam XBs™, 42 Stagebar 54s™, and 30 Atomic 3000™ strobes with a light beam visualization canopy courtesy of 4 Jem ZR44 Hi-Mass™ foggers. Kenji mounted the Auras cross-shaped on the truss to emphasize the special Union Jack shaped truss. 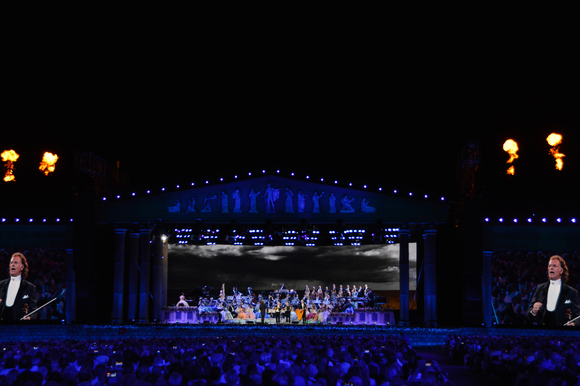 Besides lighting the truss itself, the Auras provided general color washes across the stage and were programmed to move with the melody and timing of the songs. “Of course I like the Aura’s beam,” Kenji says, “but I love shining the surface of the fixture via the backlight illumination function, which allowed me to increase the variation of usage of the fixture. Also mounted on the Union Jack truss were 20 of Martin’s 1500-watt MAC III Profiles. 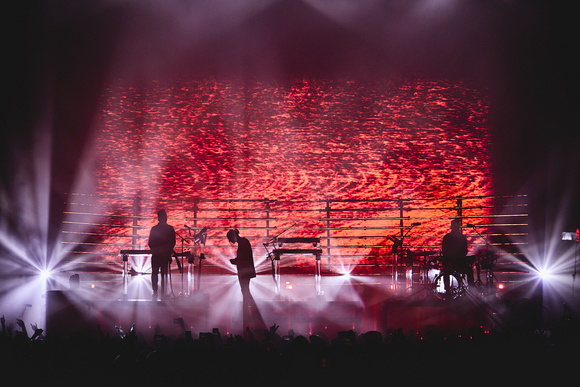 “Sometimes I used them to light up the band members and sometimes to light the audience with various gobos, which created a lot of atmosphere during the show,” explains Kenji. “I also put eight of them on the front edge of the set (7 feet high) and used them for the band members and also as a searchlight in the air,” he concludes, stating that on the next Def Leppard tour he plans to also use Martin’s recently-released, award-winning MAC Viper.